City Rock Bluff is a walk-up view point putting you some 200 feet over the White River. This view point, located in the Sylamore Ozark National Forest, gives a good look at the surrounding Ozarks. This same point is a good place to follow Back Country roads. Directions - Point 11 on our map is at Culp Road (aka Stone CR 53 and FSR 1105) at the New Hope Christian Fellowship church. After crossing the bridge over the White River at Calico drive a little over 2 miles. Turn right onto Culp Road and go 2.4 miles. This gravel road has some scenic views as well as farmlands and cedar rock glades. Road Surface - Culp Road can be very dusty! Motorcycles can make it if you are careful in the loose gravel spots. There will be mud puddles after a rain, and be quite dusty during dry spells. If you see dust covering roadside trees and plants, then you know it will be a very dusty drive. However, the dust is light and most of it will blow off at highway speeds. The mud is also easy to wash off. The only thing you need to worry about is paint chips and dings in chrome. If you take it slow, as in no more than 15 mph, you should be okay. Parking at City Rock Bluff. Walk past the rocks and old sign. 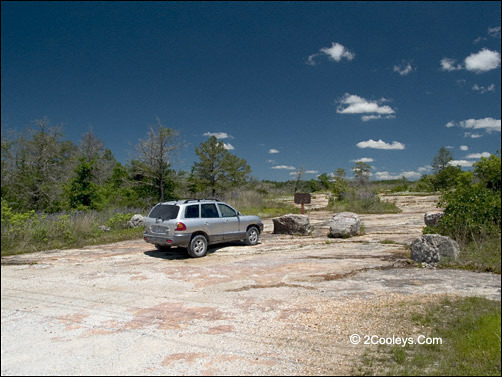 Parking - When you reach City Rock Bluff (Forest Service property) you'll find a small parking lot on the right surrounded by large boulders, and punctuated by a rusty metal sign frame. The Bluff is on the parking lot side of the road. DO NOT LET YOUR CHILDREN RUN AHEAD! IT IS OVER 200 FEET STRAIGHT DOWN IF THEY FALL! THERE ARE NO SAFETY RAILINGS! The Views - Walk toward the rusty old sign, go past it about 200 feet, and you'll find yourself on the edge of a 200 foot high rock wall. Look upstream (your left) for an old road. Where it meets the river is the old Chesmond Ferry. Imagine crossing the river on a flat barge for a trip to town. Look to your right (downstream) and you will see where you just came from - the City of Calico Rock 2.5 miles away as a crow flies. City Rock Bluff shows up on many maps as the City Rock Special Interest Area. It is Federal Property as part of the Ozark National Forest. While the rock formations are part of the reason, there are also some very interesting plants here. If you are a photographer you will find several macro subjects, as well as landscapes. In glades you'll discover wildflowers, birds, butterflies. It's easy walking too! Rock Glade - Across Culp Road from the City Rock parking spot is a large rock glade. This area makes an excellent wildflower walk, and is also fantastic for photographers who enjoy macro work. 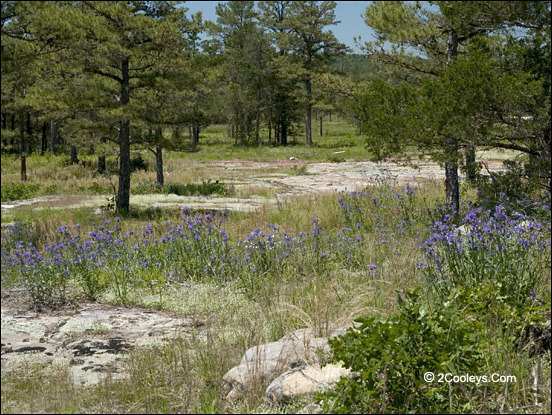 The glade is on U.S. Forest Service property in the City Rock Bluff Special Interest Area. Return To Main Tour - When finished at City Rock Bluff you can drive back out to the main tour loop to Hwy 5 to our point 11 and continue the main tour loop. Or you can head off into the Back Country from here. Wildlife Management Areas - Along this stretch of the Highway you'll see two Forest Service signs. One announces you are entering the Sylamore Wildlife Management area, or "WMA" for short. WMAs are areas set aside under different hunting and use regulations. If you plan to hunt in this area make sure to pick up the regulations book where you buy your license. Camping in WMAs requires a permit, which are available at the Game & Fish office in Calico Rock. Scenic Byway - The second sign you'll see announces you are driving the Sylamore Scenic Byway, which simply means you are driving through a National Forest. Historical Note - Sugar Loaf Mtn. Fire Tower - Before the days of satellite forest fire watch services, fire towers were manned by rangers who used binoculars on the watch for smoke. From the early 1900s through the 1980s fire towers all across the Ozarks were in use. None are in use today. 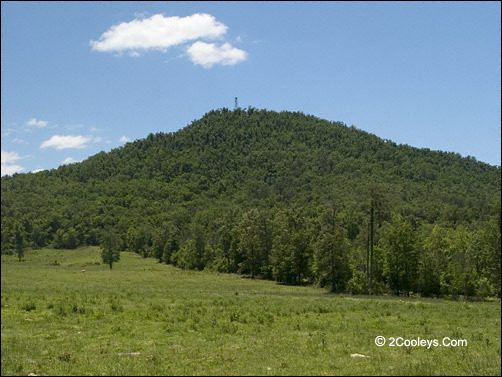 3/4 mile from Culp Road (Point 11) you'll see a high hill with a fire tower on top. This is Sugar Loaf Mountain Lookout. The road up to the tower (FSR 1123) is about 1.3 miles long and cork screws it's way up to 1,050 feet in elevation. The road is closed to vehicles of any kind, but you can walk to the top. Drive in past the Road Closed sign. In one-tenth of a mile you'll go past a couple of cabins. Just a few feet past the cabins there is a pipe gate across the road. Parking space is limited to 3 vehicles. The road is open to hikers and horseback riding. This is a good place to take a short walk for birding. Trees block most of the view so unless you want a hard hike it really is not worth the hike all the way up. Don't attempt to climb the tower! It is in bad shape. The road to Sugarloaf fire tower is open to foot traffic. Drive past this sign and park at the gate. Sugar Loaf Creek - Just past the tower road you'll cross a pretty creek named Sugar Loaf Creek. In this same area you'll see a sign identifying this section of Hwy 5 as The Sylamore Scenic Byway.